Today is a day of threes; it’s my three year anniversary of blogging chocolate and peanut butter and in that time, I’ve published exactly 333 posts. Wowzers. That is a LOT of chocolate and peanut butter! But let’s rewind a little – this past January, I made a bunch of informal mini New Years Resolutions. I didn’t write them down anywhere and I didn’t really tell anyone about them (probably for fear of jinxing my success), but floating around somewhere in my head, there is definitely a list of things I am trying to improve upon. One of the many is to taste new things. As you may be able to tell since I’ve now sustained a blog based on the same two ingredients for three years, I am somewhat a creature of habit. Somewhat – ha. But, if you can believe it, there is one classic peanut butter sandwich that I’d yet to try, and it’s fit for a king: The Elvis. 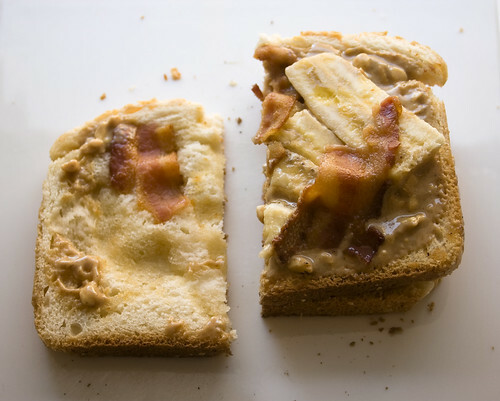 For those of you that are unfamiliar, it’s a fried sandwich that consists of bacon, honey, peanut butter and banana. It’s not your Mama’s peanut butter sandwich. Despite my desire to finally give this a whirl, I’ve honestly gotten over the bacon craze. It’s been a pretty huge foodie trend over the last few years and it seems pretty played out at this point, at least for me. I’ve been happy to try the weird creations people have come up with, but haven’t been floored by the results on the whole. Chocolate covered bacon didn’t wow me. Bacon peanut brittle didn’t scare me. But for some reason, The Elvis kind of freaked me out. Jitters aside, I’ve got a New Years Resolution to keep. And even though this is already a momentous tasting, I figure, how can I celebrate three years with two dinky slices of bread? 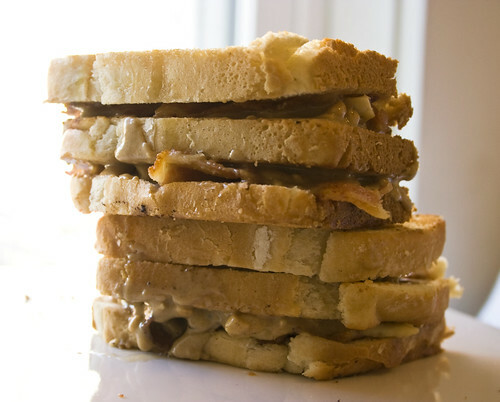 So I introduce to you to the triple-decker Elvis. To my great surprise, I actually really liked it. Since it’s probably got an entire day’s worth of calories packed into one little ol’ sammie I can’t say that it will be a regular indulgence in my kitchen, but I enjoyed every insane bite while it lasted. While preparing it, I wondered if hickory-smoked bacon was a bad choice (would it go with peanut butter?) and briefly regretted not picking up a sweeter variety. But the hickory-smoked worked wonderfully. It felt like a man’s sandwich. I suddenly wanted to throw back a beer and grunt like Tim Allen… because men do that all the time, right? So, three years in, if you’re a true fan of peanut butter, I encourage you to give it a go. Will it help if I tempt you with a rewarding chocolate dessert? That’s too many calories in one post even for me- so we’ll save it for the next one. In the meantime, Bon appetit! 1. Preheat a grill pan or griddle over medium heat. 2. Coat both sides of one slice of bread lightly with butter and grill on both sides until golden brown and crispy. Set aside. 3. Spread the butter on one side of each remaining slice of bread. Spread the peanut butter on the other side. 4. Cut the banana in half crosswise, and then slice it lengthwise 4 times to make 8 thin pieces. 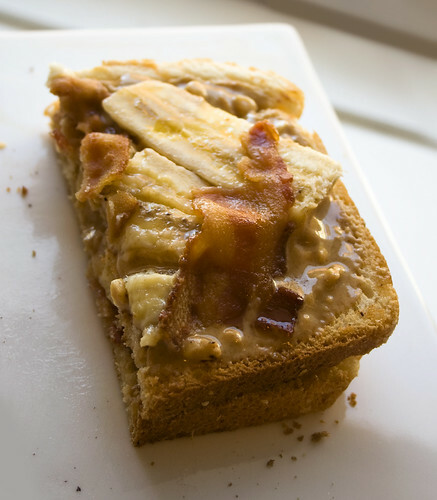 Place the banana slices on top of the peanut butter on each slice of bread. Top with bacon slices and then drizzle the honey on top of the bacon. Top one of the prepared bread slices with the plain toasted slice of bread and then top with the other prepared bread slice, butter side up. 5. Place the sandwich on the grill pan. Cook the sandwich for about 3 minutes on each side, until golden brown and crispy. Remove to a cutting board, slice in half, and serve immediately. Then eat in front of other, less daring people to weird them out. It’s fun! Happy 3 years of Chocolate & PB delights! 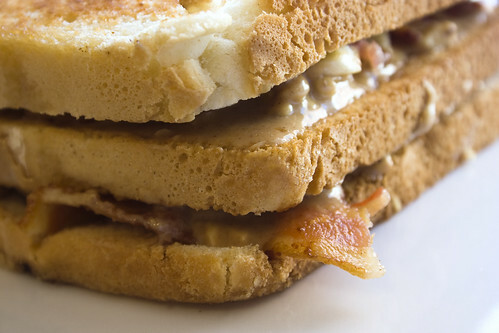 I would totally give this sandwich a go, because as far as I’m concerned, bacon will never be out of style.